The "Rare Book Room" site has been constructed as an educational site intended to allow the visitor to examine and read some of the great books of the world. Over the last decade, a company called "Octavo" digitally photographed some of the world ’s great books from some of the greatest libraries. These books were photographed at very high resolution (in some cases at over 200 megabytes per page). This section contains most of the Shakespeare Quartos from the British Library, the Bodleian Library, the University of Edinburgh Library, and the National Library of Scotland. 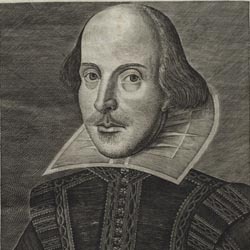 It also contains the First Folio from the Folger Shakespeare Library, a first edition of the Sonnets, and a first edition of Shakepeare's Poems. This section contains the 1733 through 1758 issues of Franklin's Poor Richard’s Almanac omitting only the 1735 and 1749 issues.The original issues of Poor Richard’s Almanac are much the best way of enjoying the most entertaining of the Founding Fathers. 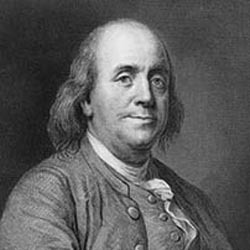 Also included in this section is Franklin's Experiments and Observations on Electricity. One of the most important scientific treatises of the eighteenth century. 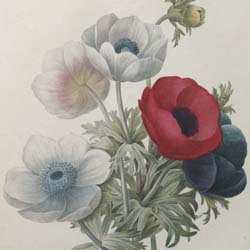 of botanical artists (1759–1840) came from a Belgian family of painters, and served (under various titles) as drawing master to the queens and princesses of France for half a century. Among his pupils were Louise and Marie d’Orléans, to whom the Choix was dedicated: the latter became the first queen of the Belgians. 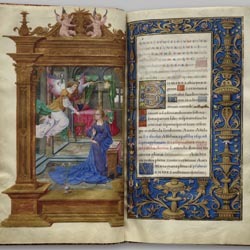 Books of hours are the most common of medieval and Renaissance illuminated manuscripts — the family copy was generally the text from which medieval children were first taught to read. But volumes of such exceptional quality as this one from the Lessing J. Rosenwald Collection at the Library of Congress are rare. Its most attractive aspect is its superb illumination — forty-two tiny paintings of dazzling virtuosity, manufactured with astonishing dexterity; nothing is neglected, from pebbles in the dusty foreground to glimpses of fantastic buildings in the furthest distance. Galileo fashioned a twenty-powered telescope and with it undertook to observe the Moon. With this device he quickly discovered that its surface was rugged and mountainous rather than uniformly perfect as was thought at the time. He later noticed what appeared to be three bright little “stars” on a straight line near Jupiter. Gradually, he discovered that these were not fixed stars but rather moons of Jupiter. 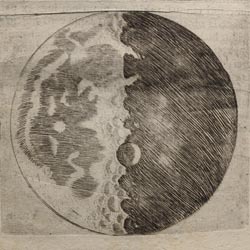 Galileo recognized that this latter fact was more important than his observations of the Moon. 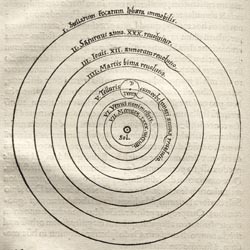 Published in 1543, De revolutionibus gave a momentous new blueprint for the planetary system. The earth, instead of resting solidly in the center of the cosmos, was set awhirl, spinning on its axis every twenty-four hours and revolving around a distant, fixed sun. 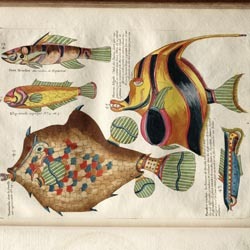 In 100 plates containing 460 brilliantly colored engravings that represent a dazzling multitude of fishes, along with crustaceans, grasshoppers, a dugong, and a mermaid, Louis Renard’s Fishes, crayfishes and crabs, of diverse coloration and extraordinary form displays the most fantastic evocation of exotic aquatic life ever produced.